Researchers have discovered an anti CRISPR-protein for the first time in the constant battle between microorganisms in boiling hot pools on Iceland. 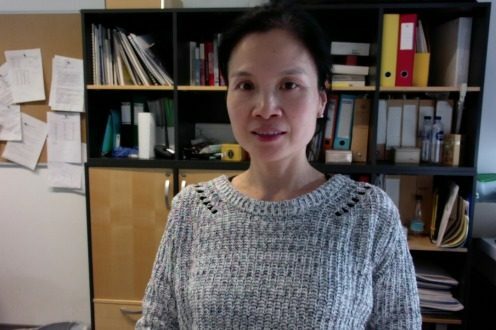 Professor Xu Peng and her colleague Ditlev Brodersen from the Center for Bacterial Stress Response and Persistence (BASP) at the University of Copenhagen have collaborated with researchers the U.S and found that boiling volcanic swamps on Iceland constitute a microbiological war zone. The new study, which was recently published in Nature Microbiology, shows how these microorganisms react to stress – knowledge that can be used in future medical development. The swamps are a habitat for single-cell and coreless organisms called archaea that, together with bacteria and eukaryotes, constitute the three domains of life. In these swamps, the archaea, type Sulfolobus, is constantly being attacked by microscopic DNA viruses called rudiviruses, which try to infect the archaea through their cell membrane. As a result, the archaea have developed a CRIPSPR-Cas defense that can register and remember prior attacks, and therefore, they can defend themselves by reusing defense mechanisms that demolish the rudivirus. However, rudiviruses have developed a counterattack against the CRIPSPR system by blocking the molecular components so that Sulfolobus cannot fend off the attack from the rudivirus in time. This is the first time that an anti-CRIPSPR component has been discovered in archaea. The research in this intense battle between microbiological organisms will potentially contribute to the field of bio-technology and to the development of anti-microbial drugs in the future. Read more at Aarhus University here. Further reading can be found in the scientific article at Nature Microbiology here.